Discover Africa's abundance of wildlife with this 23 day luxury Cape Town to Kasane journey, discovering the Okavango Delta & the Moremi Game Reserve. The Okavango Delta is a remote, water-locked wonderland. Here you’ll find African wildlife in enormous abundance. In this alternate dimension, human beings have no foothold, and their presence here can be just as surprising to the many creatures that call the delta home. Many hundreds of bird species flock to these waters and thousands of animals are drawn to the banks daily. The Moremi Game Reserve occupies the east and central areas of the region. Here, dugout canoes are used to navigate past hippos, elephants and crocodiles. You’ll soon find yourself immersed in a different world entirely. Make the most of it, and capture those moments of wild wonder at their most authentic. Welcome to Cape Town for an exclusive three night Special Stay, with views of the waterfront and Table Mountain. Tonight, meet your Tour Director for a welcome drink and dinner. Ascend Table Mountain by rotating gondola for wondrous 360 degree views. Sample South Africa’s finest vintages with a winelands tour. 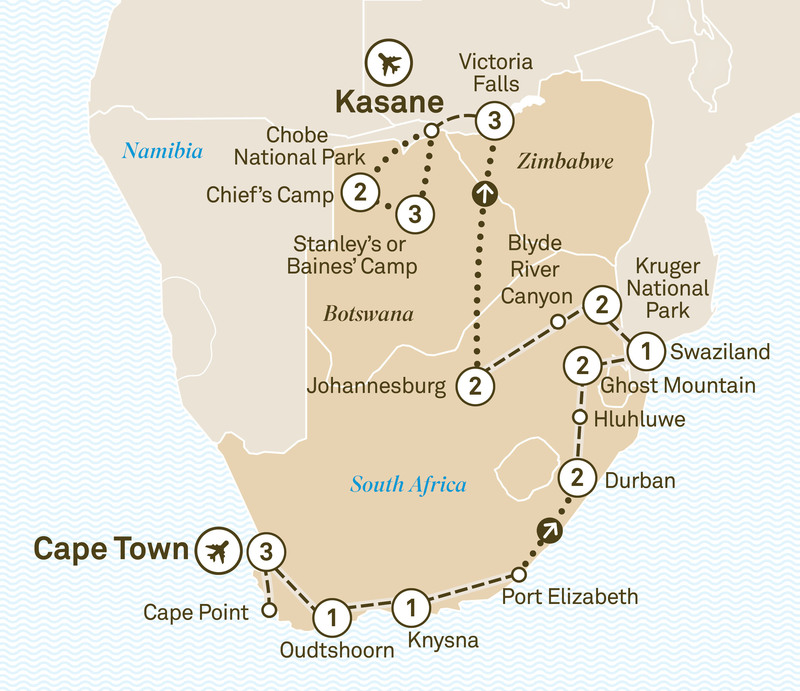 Alternatively, visit history rich Robben Island, take a township tour, or a Harley DavidsonTM ride. Journey along the Atlantic coastline to Cape Point, stop at the Cape of Good Hope, then visit Boulders Beach, home to an African penguin colony. Stunning semi-desert scenery awaits en route to the town of Oudtshoorn. Later, discover a wonderland of underground chambers at the Cango Caves, among the largest in the world, before your overnight stay. Learn about Africa’s largest bird at a local ostrich farm, then head to Knysna on the Garden Route, famous for its oysters. You’ll enjoy an overnight stay at your hotel. Enjoy a scenic cruise with expert commentary on the region’s flora and fauna. Travel along the Garden Route to Port Elizabeth and board your flight to Durban. Enjoy a two night Special Stay at your hotel, the ultimate in colonial charm and style. Discover the beach side town of Durban, famous for its Indian and colonial influences. Enjoy learning about the Zulu battles that took place close to Durban whilst sampling afternoon tea. The Dolphin Coast region of Natal has a sea of sugarcane fields. Enter Hluhluwe-Umfolozi Park, world-renowned for its rhino conservation program. Later, check into your elegant hotel for a two night stay at the foot of Zululand’s legendary Ghost Mountain. This evening, you’ll be treated to a mesmerising display of traditional Zulu dancing, complete with dramatic local drumming. Visit a traditional Zulu community in the Lebombo Mountains, and be welcomed by the village chief for a private tour. Arrive in the tiny kingdom of Swaziland. Journey through the magnificent valleys of Big Bend to your resort, nestled within an idyllic Botanical Garden, for an overnight stay. Enjoy time at leisure to explore the magnificent garden. The famous Kruger National Park stretches an impressive 450 kilometres. You’ll enjoy a two night Special Stay at your lodge, situated on a private concession within the park. The Sabie River flows through it and is home to the highest recorded concentration of leopards in Africa. Take a game drive in an open safari vehicle this afternoon. At the end of your game drive, partake in one of the most enjoyable of safari traditions – Sundowner drinks. Soak up the night-time ambience while dining at your lodge. Limitless game viewing possibilities await, so make sure you bring your camera. Specially adapted Land Rovers are able to traverse the entire Kruger National Park without restriction to track the Big Five – lion, leopard, elephant, rhino and buffalo. Encounter hippos by exploring the shores of the Sabie River on foot, with a game ranger, or enjoy a fascinating lecture on wildlife. Alternatively, visit a local community. Take in the magnificent Panorama Route on the road to Johannesburg. You’ll view the Blyde River Canyon, third deepest in the world, then visit Bourke’s Luck Potholes and enjoy spectacular views from Wonder View. Check into your stylish hotel for two nights. Visit Soweto with your local guide, walk the streets that Mandela walked as you visit his house. Learn about the 20th century South Africa during your visit to the Apartheid Museum. Board your flight to Victoria Falls, one of the Seven Natural Wonders of the World. The world’s largest sheet of falling water rises 108 metres high and spans a gorge carved out of a flat plateau. Check into your marvellously colonial hotel for your three night Special Stay. Tonight’s outdoor dinner features a mesmerising display of traditional dancing. Be treated to a special Sundowners cruise down the Zambezi River and watch the teeming wildlife on the banks, drink in hand, just upstream from the Victoria Falls. Large concentrations of big game call Chobe National Park home. Embark on a game drive along the shoreline, where predators often come to drink. Later, enjoy a cruise on the Chobe River, home to huge herds of elephants and buffalo. Large pods of hippo and giraffe families inhabit the banks and woodlands. Visit a typical Zimbabwean village to gain unique insights into traditional tribal life and meet the elephants as part of your visit to the elephant sanctuary. Later, witness the power of Victoria Falls with a tour of the Zimbabwean side of the world’s largest waterfall. Enjoy dinner in the beautiful Livingstone Restaurant. Helicopter flight - Enjoy an optional helicopter flight over Victoria Falls. Enquire for details – additional expense, please book on tour. Travel to Kasane in Botswana for your flight to the Okavango Delta. On arrival you’ll be met by a Sanctuary Retreats representative and transferred to Chief’s Camp where you’ll enjoy a two night stay in a luxury bush pavilion. Let an experienced guide and tracker show you unique aspects of the bush during the day’s game drives. You can look forward to encounters with swimming lions, wading giraffes and huge pods of hippos. Fly low over swamps teeming with wildlife to Stanley’s or Baines’ Camp, where you’ll stay in a beautifully appointed safari tent for the next three nights. Large herds of elephants, zebras and buffalo populate the open areas, hippos inhabit the streams and lakes, and the wooded areas are home to predators such as leopards and wild dogs. You’ll enjoy morning and evening game drives that will take you right up close to animals who’re not used to regular human contact. Later, compare your sightings with fellow adventurers as you enjoy a colonial-style High Tea. Embark on a bush walk with an expert naturalist. Alternatively, enjoy a game drive to another area of the reserve, or a mokoro canoe safari into the delta’s wondrous waterways. Enjoy incredible views as you fly to Kasane, connecting to your onward flight. This is an independent tour, not escorted by a Scenic Tour Director. Flights within Botswana are via light aircraft. From Cape Town to Nairobi, go in search of the Big Five on game drives, discover the wonders of Kenya and explore Africa's beautiful Garden Route. A tapestry of landmark moments, explore South & East Africa discovering Africa's best National Parks, mighty Victoria Falls & fascinating tribal villages. Enjoy early morning & evening game drives to discover the local wildlife including zebra & hippo. Spend three nights in a beautifully appointed safari tent.